If you want to include forum functionality on a WordPress blog, you’ll notice that there aren’t many good options available (especially if you rely on the WordPress plugin directory). 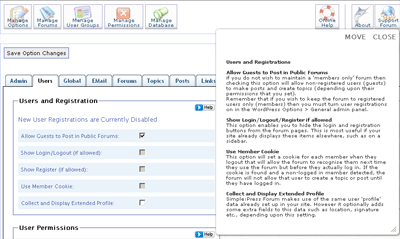 For reliable, feature-filled forum functionality, people often look to external systems instead of WordPress plugins. However, Simple:Press Forum is a relatively unknown, but powerful plugin that is feature-rich, easy to use, free, and integrates perfectly with WordPress. It is user- and admin-friendly and I certainly recommend it. Forum post – blog post integration: Basically, whenever you write a blog post, you can choose to make an identical forum post at the same time. The Simple:Press Forum code is simple to navigate should you ever wish to extend of modify it. For example, for the phone exchange forum on speakoutwireless.ca, I didn’t have too much trouble implementing feedback profile capabilities. Simple:Press Forum itself continues to be in active development, so you can always suggest new features or help out the developers. Hi Tony, that feature is regulated by the WordPress registration option. So, you need to enable that in the Settings > General page for WordPress before you can do so in Simple:Press. Be sure to check the Simple:Press support forum as well, as they are very responsive there. I just downloaded it and I love it, but I cannot seem to figure out how to make it so that new guests can register, can you please shed some light on this? Simple:Press links do not work. The site is gone. Reply from Peter: Thanks for pointing that out. They’ve moved to: http://simple-press.com and I’ve updated the links in the post now. I think I’m going to check out Simple Press. It seems to get better reviews than bbPress or any of the other WP forum options. Yes Simple:press is a great forum product and I think much better than bbPress and Forum Server which I have also tried. My only criticism is that the user documentation appears to be quite scanty, but the Support Forum is good and is checked on a regular basis. am I right in assuming that this plugin only works for WordPress.ORG and not .COM? Reply from Peter: Yes, unfortunately. Reply from Peter: Thanks! I’ve updated the links now.